This beautiful cedar shake ”Nantucket style” home is situated on a very private, unique 1.87 acre home site in Kiawah’s prestigious Vanderhorst Plantation. The open floor plan includes a gigantic family room, dining room, and kitchen on the main level. The spacious gourmet kitchen is fully equipped with top of the line appliances and a large stone island. The first floor also includes a beautifully crafted cherry wood paneled library and a large laundry room. Multiple sets of French doors lead out to an enormous wood deck and a large 16ft x 30ft saline pool and hot tub. 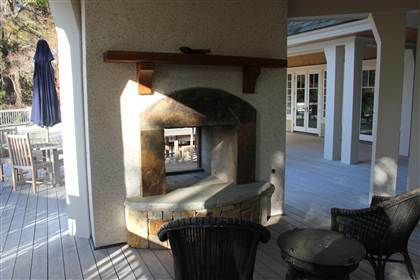 An outdoor kitchen, gazebo, and screened in porch complete the outdoor space! The second floor is completely dedicated to the comfort of friends and family, providing 4 spacious bedrooms and 4 bathrooms with multiple beds for guests. On the top level one finds a luxurious and sophisticated Master Suite, containing a beautiful master bedroom facing the ocean. Uninterrupted Atlantic Ocean views, a spacious walk-in-closet, and spa-like bathroom with soaking tub combine to make the Master Suite the ultimate luxurious island escape. A private study, located just off the master bedroom, is the ideal place for a morning cup of coffee or a quiet afternoon of reading. The home features an elevator that services all 3 floors of living space from the garage. A separate guest house provides 3 gracious bedrooms and 3 bathrooms, which comfortably sleeps at least 6 guests. Your private boardwalk offers direct access to Kiawah’s 10 miles of pristine beaches. . Click here for additional info.